Betaland Oscar™ provides the capacity to process, monitor and analyze a high volume of employees and their related transactions in an integrated manner, for each of the functions required for a payroll process and a complete human resources management. Betaland Oscar™ offers significant capability to define income and deduction formulas, benefits, tables, etc., in a user-friendly and flexible manner, as well as the capability to process the organization payroll using the information gathered through electronic clocks in an integrated manner with the TimeClock™. At the same time the payroll process generates unlimited number of customizable lists for the employees, payrolls & vacations, as well as financial reports. Betaland Oscar™ is a flexible, easy-to-learn system for managing student and contact information. Quickly produce paper and electronic correspondence, school, district and state reports, student ID cards and much more. Enjoy complete control over individuals’ security and access privileges. Customize Oscar with user-defined edit screens, add wide number of your own data fields, setup and build your own filters, reports and labels. Maintain and easily access complete student histories. The Human Resources module provides the right tools to manage all aspects of human resources department. Betaland Oscar™ offers a wide range of sophisticated features to make payroll administration more efficient and cost-effective. Designed to be as flexible and intuitive as possible by automating payroll processes and helping to minimize time-consuming administrative tasks. Betaland Oscar™ offers superior levels of flexibility including individual and group on-line payroll processing with the ability to re-run the process as many times as you require without ever needing to roll-back. Allows the effect of changes to be seen immediately, saving valuable time & effort. A range of commonly required income and deduction rules are supplied pre-defined to allow fast track implementation, while a powerful point and click calculation facility allows additional rules to be generated easily using smart formulas and efficient counters. 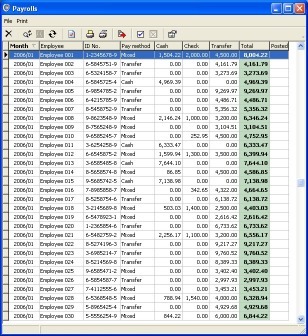 With this powerful module you can link any database record to an unlimited number of attachments. It provides the school administration (organization) with the tools to create, manage, and control electronic documents. In other words, it extends the functionality of OSCAR to help users collect all related data, whatever it looks like, into a single application. Oscar can operate within an advanced network environment in addition to a single PC. The advanced SQL database server and the unique processes, built in Oscar, allow it to accommodate with network environments securely and easily. Oscar is available in both single-user and multi-user versions.